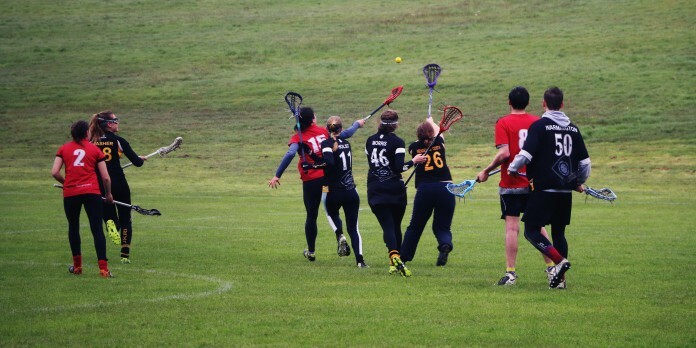 It was a wet and windy event for mixed lacrosse but this didn’t stop the teams giving it all they’ve got with Lancaster bagging the first point early on in the match. It wasn’t long however before York brought it back to an even playing field. From then on it was neck and neck with each team getting just one point ahead at various points in the game and every other point bringing it back to a tie. There were some incredible passes throughout but little stick checking going on, causing Lancaster’s Luke Wilson to describe it as “like an egg and spoon race.” It was 3-3 before Lancaster ran away with it, edging forward by one point to begin with before Simon Benyon scored points five and six putting Lancaster well and truly in front. Their dedication didn’t falter however and even as Luke came off with blood in his gum shield, he was soon back on the pitch to end the game. York managed to scrape back one point right at the end but it wasn’t enough as Lancaster mixed lacrosse team win the match for the first time ever in Roses history with a final score of 6-4! It seems team Lancaster may be regretting the fight to decrease the points awarded for mixed lacrosse now bringing it from 4 points to just 2, but still a massive congratulations to the team making Roses history.